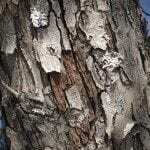 Bark is shedding off the trees. Like losing their skin. Crepe MyrtleIs Bark Shedding From A Crepe Myrtle Tree Normal? What type of tree are you referencing? This can be a naturally occurring event or signs of disease. Here are a few article for you.